Have a 3D printer? Or at least access to one? You're pretty much halfway there. 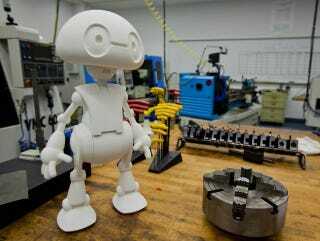 The at-home robot maker will be buyable online at 21stCenturyRobot.com later this year. It will include the designs for the hardware that you can make if you have a 3D printer you can use. It will also give you the moving parts you can't print, like motors and wires and processors and batteries. The cost is relatively low because Re/Code says it runs on Intel Edison—a cheap computer on a chip. If it were fitted with a better brain, like say an i5 processor, it would run more like $16,000. The chip company shows off its open source robot that can talk, dance and tweet.